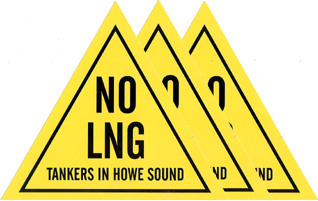 We have reprinted our yellow NO LNG stickers (16.5 x 14 cm). These, as well as the ‘SAVE HOWE SOUND again’ stickers can be bought at $1 each on Bowen Island at the Ruddy and Cates Pharmacy. Yellow sticker distribution will start in Squamish very soon through My Sea To Sky.